The small, black German car with a sporty red Naugahyde interior, probed its way down a snowy two-lane highway like an Olympic bobsled between high imposing snowbanks, somewhere in western Massachusetts. In the early 1960s the new freeways were contemplated but not completed and the local roads were not effectively plowed or maintained, especially at night. Heading north out of New York City was still an adventure into the wilderness and the great unknown. From the cozy confines of suburban Long Island this was a big step out of our comfort zone, but we were a brave new modern family that made up with rugged resolve for what we lacked in real resources. There was fear but we had courage. Dad drove slowly but steadily into the night as Mom death-gripped the dashboard handle with two hands and stared intensely into the night, looking for cars, deer or Big Foot on the edge of the highway. ‘Turn your bright lights on Arty,’ she snipped nervously, looking down , on the gauges but he only quipped ‘Nancy, they are on’ as he pounded the floor button twice with his left boot to show her the vague difference. Mom, a school teacher who was always teaching, fancied herself as the better driver, being a liberated, new-age woman of the 60’s, but Dad drove snowplows at his job in Public Works and he relished this kind of blind-braille driving and the imperceptible contrasts of white-on-white as we almost floated down the road. My seven-year-old brother and nemesis Mark was asleep in the back seat under a pile of blankets and coats, stretched out the full length of the small seat, until I snapped him in the ear with my little finger. ‘Maaaaa’ he moaned instinctively to no one listening in the dark. Our baby sister Mary was at grandma’s house, safe, warm and dry but too young for this winter adventure. The cramped car smelled like Old Spice, McDonalds and wet wool, and the side windows were iced up but translucent. The 56-horse-power air-cooled engine did not have much oomph and the little heat it gave off was directed to the window defroster, but the engine was in the back over the drive wheels and we plowed on relentlessly through the night. ‘Almost there Ginty, can you hold it’, Dad asked optimistically as we passed the striped concrete retaining wall that indicated our turn on to a snow-packed dirt road. ‘Maybe,’ I said semi-courageously as we bounced and jostled onto the rural road. It became even darker as we headed up the hill making random left and right turns on smaller roads based on my mother’s instructions and intuition. We finally pulled up in front of a small dumpy farm house with peeling yellow paint and several non-descript outbuildings behind it with a small sign over the barn in the distance that announced alliteratively, ‘Herman Harris Horse Hotel’. Dad hopped out and banged on the front door in the driving snow. A barefooted man answered, clothed only in his waffle long johns, with a large pot belly and an unshaven face. Herman Harris was a local here in Northern Massachusetts, born and raised in this house, and he had just finished his daily multi-tasking schedule of; driving the school bus and snow plow, feeding horses and shearing sheep, fixing snow-mobiles and harvesting maple syrup, chopping wood and poaching deer. It was an increasingly specialized world in the 60’s but Herman hadn’t gotten the memo yet. Scratching himself quizzically in the doorway, backlit by the changing light of a black-and-white TV in a living room cluttered with cheap beer cans and dirty dishes, Herman tried to figure out who this stranger was and what we wanted. ‘The key, the key – to The Farm up the hill,’ I overheard my Dad shout several times as he stomped his cold feet, until an actual light bulb of recognition went on over the Herman’s head and he invited my Dad in heartily while he searched for the key. Herman dwarfed my Dad when he put his arm around him to lead him inside. Dad is not a small man by any means, but Herman enveloped him and we wondered if he would ever return. After an interminable delay, Dad finally came out and vigorously shook Herman’s large gnarled hand several times, thanking him profusely, and ran back to the car. Dad had no key but only the hope and a prayer that one would be cleverly hidden under the Welcome mat. He dropped the parking brake excitedly and gunned the VW up the hill to a quick hairpin turn and up a final steep stretch to a ghost-white house that emerged slowly from the snowy mist. The lights were on but no one was home. Dad kept it floored until we crested the sill of the unplowed driveway, rammed into a snow bank and crunched to a stop. We had arrived. The Farm, as our family called it, was a regal 100-year-old Colonial farm house with barns and breezeways, mud rooms and garages, that my uncle had bought in the late forties, for a song and a prayer - we imagined. It was very rough for the first few decades with a stream-fed cistern water supply, a leach field in the lower pasture and an actual ice-box to keep food fresh. When my aunt insisted that they move the family out of gentrified suburbia to the country for a few years of ‘perspective’, my uncle had The Farm fixed up with modern conveniences such as a cozy white-oak library, a wine cellar, a washer and dryer and a good heater. It was all done with such style and class that complimented the historic house so well that we couldn’t wait for our each invitation to visit. To us it represented an escape from suburbia to a rural life that we never knew and a gateway to the New England wilderness of Emerson and Thoreau The subtleties and luxuries of this place were not lost on my five-year-old sensibilities. I loved it. We dug out the door mat, found the key underneath and let ourselves in. It was freezing cold out, not the Long Island dreary-damp, build a droopy-dirty-snowman kind of cold, but a dangerous artic clean-clear cold with a biting wind that put it well below zero. Mom found the thermostat and turned the heat on while Dad and I went down some spooky stairs to check the water. The cistern was flowing and ice free but my Dad plucked a dead mouse off the surface and threw in some chlorine while he winked at my astonishment and said ‘Don’t tell your mother.’ We came upstairs laughing and helped unpack food and tons of frozen luggage that emerged from the front boot of the VW like clowns from a circus car. We waited for Dad to take us upstairs because there was that scary picture of an emaciated woman with bug eyes over the steep stairs. We found our new separate bedrooms to share and my brother and I bounced on the beds with delight as we unpacked our plaid flannel pajamas. After a snack and a story, we went to bed but not to sleep as we heard the large maple tree howling in the wind and scraping the window with an errant branch. Every hour or so a snowplow would scream up or down the hill next to the house and it sounded like it was going to take the living-room wing off during its next pass. The house was full of creaks and groans that we imagined were benign spirits in the night, or at least secretly hoped so. We woke at first light to a blinding blizzard outside, the smell of fresh coffee and bacon cooking downstairs, the sound of my Dad tinker-fixing something in the library and my Mom singing along with Petula Clark’s ‘Downtown’, the only record in the house. I jumped up and put on my waffle-white cotton long johns, dungarees and red, white and blue scratchy-wool Olympic ski sweater with matching hats that my Mom had knitted for my brother and I for Christmas for when we learned how to ski. Today was the day. After breakfast we drove down to a local Ma-and-Pa ski hill on the Deerfield River called Thunder Mountain that made up in quintessential New England beauty for what it lacked in size and sophistication. There were incredible vistas in every direction but snow-making hoses and lift cables were scattered in the snow in the foreground. After endless delays sizing rental skis tying our boots and adjusting our cable bindings, we were ready to shred. Mom applied some yucky waxy Chap Stick lipstick to our lips and they sent us ski school. My brother and I skied down to the Thunder Bunny hill, unsure at first but fully competent after 100 yards. ‘I got this’ I thought as we were introduced to our ski instructor, Pierre Hiver, from Montreal. Peter Winters. I didn’t need lessons but this guy was so handsome and slick and had such a cool French accent that I thought I’d humor him for a while. He taught us left and right turns, Pizza and French fry, how not to get killed on a rope tow and we were off. I had a bomber-proof snowplow in no time that I employed at high speeds for the next five years. I didn’t want to parallel yet and that Stem-Christy turn was just plain silly. The weather was howling and we were sopping wet but we didn’t notice until it was time for lunch and hot cocoa. In the afternoon I skied with my family and they gave us horse blankets to keep us warm on the slow lifts. My Mom and brother eventually went in for more mocha but my Dad and I braved the storm all afternoon while he continually shivered and asked me if I was warm enough. I don’t know if he was staying out there for me or I for him but we were having a great time. 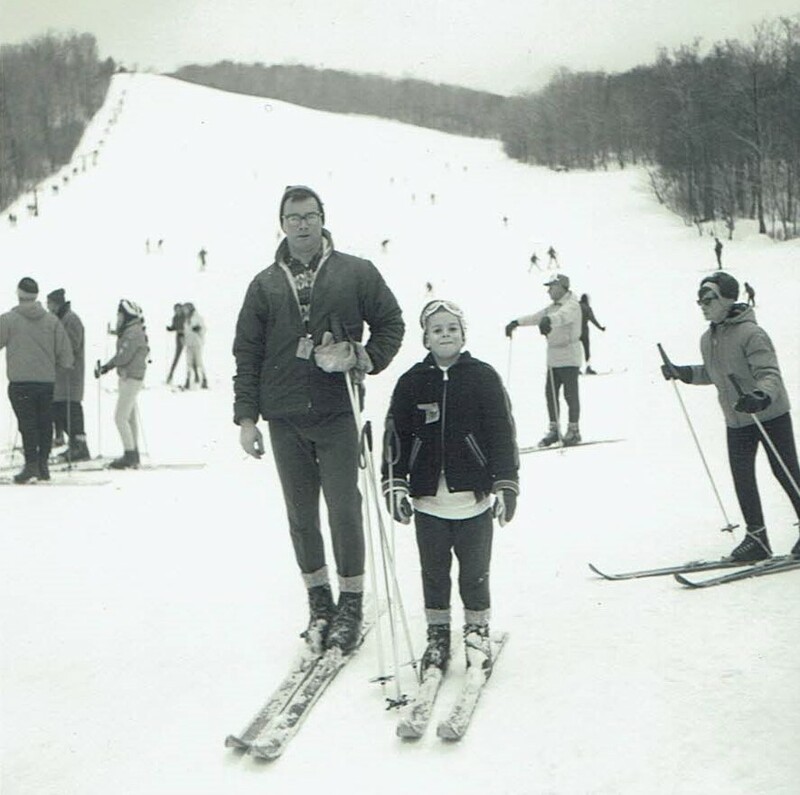 The chair lift usually hit me in between my shoulder blades so Dad had to lift and stuff me into the chair. At one point he dangled from the chair precariously just to fix my loosened binding on a hanging ski. This is true love, I thought. By the end of the day we were wet, cold and exhausted as we piled into the cold bug to head back up the hill to The Farm. The gas pedal was frozen down so my brother had to crawl behind the shifter and pull it up repeatedly when my Dad told him to as we negotiated the hills and the hair pin turns. Back in the warm house we lit a fire and danced around in our long underwear, just like Herman Harris, as the cold outdoor winter scene in the large kitchen window turned to a dark reflection of the warm, raucous family meal at the long kitchen table. We ate ravenously, joshing and telling stories, bonding closer than we had ever been in the humdrum, everyday Massapequa life that seemed so far away. Not long after dinner we went to bed early and slept the sleep of those who had just been reborn. I dreamt of Pizza and French Fries, hot chocolate and snow, endless snow. I had no idea that winter was so fun and so wild and that it led to activities and adventures that were so invigorating and liberating. I was so glad that my family had made the herculean effort to introduce us to this new season, sport, experience and lifestyle, that I swore on the spot, I would embrace for my entire life. An extended arms height over our heads. That still gives me waxy smell and taste-sensory flash backs today.